Prakruti tu swabhav | c. vi. Prakruti is the expression of the body functions its morphology & physiology of an individual. Prakruti is the nature and attitude of an individual. Prakruti is the body constitution expressed with qualities of doshas like vata, Pitta and Kapha. Body constitution is the natural form or the original status of the body showing different physical and mental qualities. Prakruti is one’s own constitution, which is an expression of tridoshas at the time of conception. Prakruti is the base line of doshas, which is normal for a particular person. His body characters, morphology, physiology follow the course of doshas expressing their characters. Understanding your body constitution is the best guideline for healthy life. To maintain the balance of doshas knowledge of owns constitution is very important. Daily regimen and seasonal regimen are advised based on the physical constitution. Each body constitution shows susceptibility of a person to particular diseases of that dosha. E.g. Vata constitution people are prone to arthritis, constipation while pitta constitution person is prone to hyperacidity, skin issues. Persons with kapha constitution are prone to sinusitis, chest congestion, obesity, and diabetes. 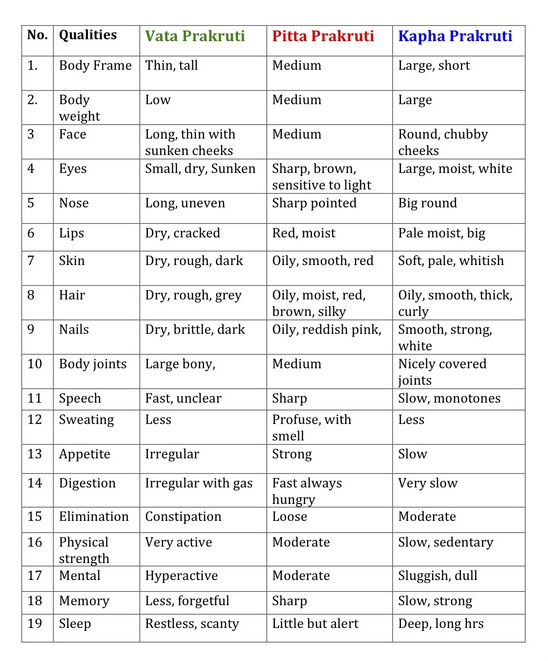 The combinations of vata pitta and kapha dosha 7 types of body can easily see constitutions. These variations of doshas are seen in deha prakruti expressing more physical characters of the body. Vata is dry, mobile, light, cold and rough and very swift in nature. Person with vataj prakruti shows manifestations of these characters in morphology, physiology and physical and mental behavior. Vata constitution person is tall, thin with small body frame. His face is long with sunken or depressed cheeks. His skin is dry, rough and shows lack of luster. They show intolerance for cold. They are physically weak. They lack sound sleep, show restlessness. Their mind is never steady. They forget things very easily. Such persons are generally talkative and very active. Pitta is hot, sharp, and liquid in nature. Person with Pittaj prakruti shows these qualities. Pitta constitution persons are generally medium frame, medium height. Skin is very soft, reddish and unctuous shows luster. His nails, eyes, tongue are coppery red in color. They show high appetite. They show moderate strength and stamina. They can not tolerate heat. They are very sharp and bears intellectual mind. Such person presents clarity of mind and sharp talk. Kapha is cold, heavy, soft, and unctuous. Kapha prakruti person shows large body frame, generally overweight. The skin is soft, unctuous, moist but pale and cold. They present very beautiful big white eyes and cheeks are chubby. They have low appetite and show sluggish activities. They sleep for long hrs. They speak slowly with deep voice. They are calm and tend to be less active. But show good stamina.